'Today my daddy said to me, "It's time you learnt to peck a tree."' And so begins a very busy day in the life of this little woodpecker. First, under Dad's careful supervision, he holds on tight to the tree, and peck peck pecks at the wood. Soon enough, he's pecked a hole. There's a corresponding hole in the page of the book, emphasising his success. Flushed with triumph, the little woodpecker heads off to try pecking holes in a few other things: a gate, a front door, then — once inside the house — a hat, a mat, a tennis racket, an armchair, a teddy bear, even a copy of Jane Eyre! Clothing isn't safe, neither are bathroom items. In fact, he pecks and pecks until there's nothing left. By this stage, there's not much of the pages left either, as they too are riddled with holes! The bold illustrations combined with the use of solid blocks of primary colours make this a book that will delight the very young. 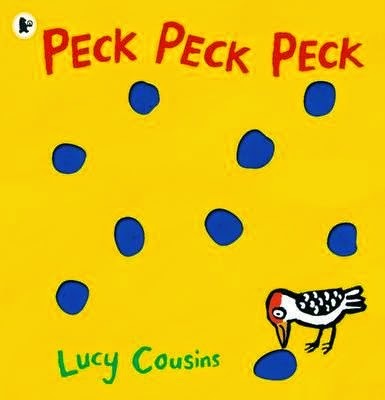 Add to this a fun rhyming storyline by the creator of the Maisy books, and plenty of holes for little fingers to wiggle through, and Peck Peck Peck is sure to be a popular choice at bedtime!